The program for the 47th LPSC is available! The SETI Institute, with support from the NASA Astrobiology Institute, is funding a limited number of student travel grants. 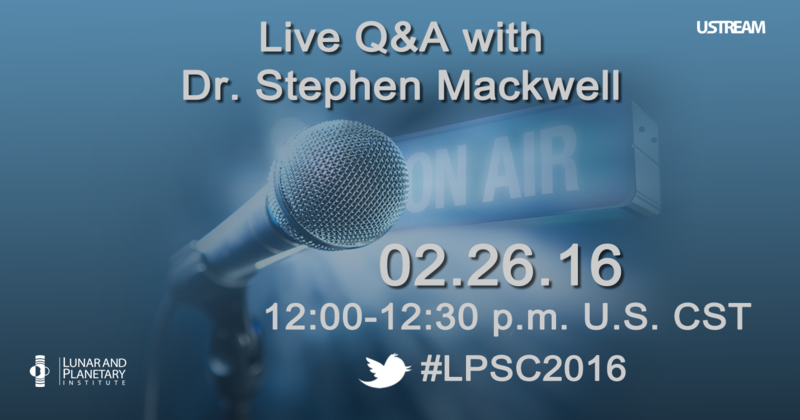 Live Q&A with Dr. Stephen Mackwell! Have questions about LPSC? Take part in the first-ever live Q&A at 12:00 noon (U.S. Central Standard Time) on February 26. Submit your questions now through February 19 via Twitter or the submission form provided on the Q&A website. This entry was posted in Meeting Announcements and tagged LPSC, Lunar and Planetary Science Conference on 2016-02-05 by Julie Tygielski.